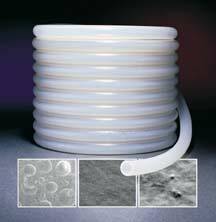 Use one of these soft, flexible tubes in applications where flexibility and purity are important. Ideal for general purpose fluid transfer over a large temperature range. Available in two package sizes. Call for quantity discounts. 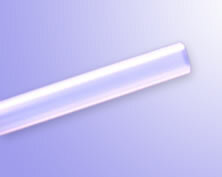 Low Cost Silicone  This low cost tubing is translucent and flexible over a wide range of temperatures. Ideal for use in non-corrosive fluid transfer applications. Peroxide cured. Sanitary Silicone (Tygon® 3350)  Sanitary silicone has been formulated for high purity applications with a smooth inner bore that can reduce the risk of particle entrapment. Platinum cured. VersilonTM Silicone (SPX-50)  Peroxide cured Versilic tubing is formulated for use in applications where flexibility, resiliency and durability. C-Flex®  C-Flex offers exceptional flexibility like silicone, however it has a greater chemical compatibility and a lower price.